The Sugary tomato was the 2005 All-America Selections award winner in the tomato category, and growing an award winner always tips the scales in your favor. That's because expert gardeners throughout the U.S. have judged the Sugary cherry tomato to be outstanding compared to other varieties of the same type. 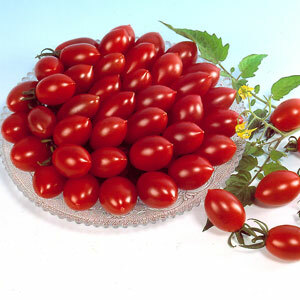 Like the name implies, this variety is deliciously sweet, measuring 9.5% sugar content, higher than most tomatoes. The designation F1-Hybrid tells you this variety has been cross-produced from two distinct "pure" tomatoes. Because 'Sugary' is an F1, or first-generation hybrid, it should have better-than-average vigor and give more uniform and bigger yields. But if you save seeds for next year you'll probably not be able to recognize, or like, the tomatoes produced. The Sugary cherry tomatoes have an interesting shape; they have little points on the blossom end. The indeterminate (tall-growing) vines are quite productive and the fruit grow in clusters like grapes. Like all indeterminate varieties I'd recommend staking or caging as the vines will sprawl. Sugary cherry tomatoes are vigorous and easy to grow from seedlings purchased at your garden center or grow from seed indoors. They can be planted outdoors when the soil warms. Recommended safe planting dates can be found in when to plant tomatoes. I recommend buying Sugary tomato seeds at TomatoFest because not only do they specialize in heirloom tomato seeds that are certified organic, but their service is great and their staff friendly.